Take inventory early of your needs for plant materials, supplies, and equipment and order the items you need or buy them locally. Seed. Buy clean, viable, disease-free seed. Most seed from reliable seed companies will meet these specifications. It is best not to use seed more than one year old. If you do, sow the seed thicker than usual to insure a good stand of plants. It usually does not pay to save your own seed unless you have a variety not available from any other source. Plants. Some vegetables do best when they are started indoors and then transplanted into a garden. The plants should be healthy, stocky, medium-sized, disease-free, and insect-free, with good roots. Avoid using plants that are tender, yellow, spindly, or too large. Do not use plants with spots on the leaves, brown lesions on the stems, or knots on the roots. Growing your own plants has these advantages: (1) You can use varieties not normally available; (2) you can have plants available when you want them; and (3) you can derive satisfaction from starting plants yourself. The main disadvantage is that the plants must be grown under carefully controlled lighting and temperature conditions. Because starting plants indoors involves some specialized techniques, it is not discussed here. Equipment. Have all your equipment and tools ready before you begin to work the soil. 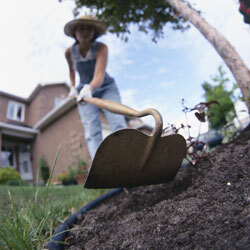 A hoe, spade, garden rake, trowel, measuring stick, and planting line are essential for all gardens. A wheel hoe or hand cultivator is practically a necessity for larger gardens that are intensely cultivated. A seed drill is also desirable for larger gardens. Keep all tools clean and well sharpened. Each time you use them, clean them thoroughly and rub them with an oily rag before putting them away. Some type of sprayer will be needed to control garden pests. For a few plants, a hand-held spray bottle can be effective. Many pesticides are sold in ready-to-use formulations. If you have several plants or a large garden, a sprayer that attaches to the hose is recommended. Supplies. Obtain fertilizers, insecticides, and fungicides early so that you will have them when you need them. 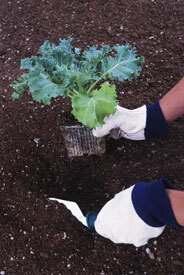 Other supplies you may need include mulching material, stakes, plant protectors, and pots. As you read this guide, make a list of the miscellaneous supplies that are required for the vegetables you are going to plant and have them ready before you begin gardening. After completing Step 5 you will know how much fertilizer, lime, and starter fertilizer you will need. Insecticides and fungicides are available as ready-to-use formulations and concentrates. Be sure to identify the problem before you purchase or use any pesticide. All insecticides and fungicides should be treated as poison. Follow all directions and heed all precautions on the labels. Store them out of the reach of children and animals, in a locked place, preferably outside the house.